Joseph Durham is famous for his portraits of idealised English youth. 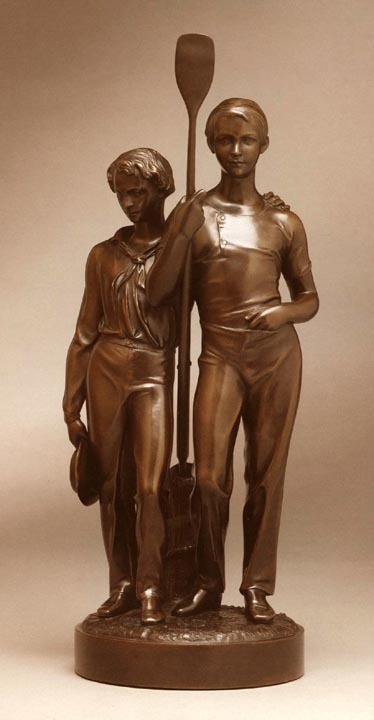 His best known sculptures are of cricketers, but this rare and extremely finely cast model shows two youths standing at the quayside, one holding an oar. Durham studied under E. H. Baily, the sculptor of Nelson's column and was a successful sculptor of both monuments and sculptures for the home. He was one of the 12 sculptors who represented Britain at the Great Exhibition of 1851. Bowman, Robert. Craft and Creation — 2005. London: Robert Bowman Gallery, 2005, pp. 59-60.